It’s been an outstanding week here in New Zealand and today is the “final” day for our group. We are staying an extra week to hike the Routeburn Track, but tonight is the “mandatory” farewell dinner so we hadn't planned anything this morning other than sort through our backpacks, double check food stuffs and laundry. We slept in later than normal, utilizing the hotels blacked out drapes to protect us from the morning sun. We haven’t seen the sun much this week anyway, between rain and the snow storm that capped the mountain peaks earlier this week. Thankfully the snow has melted and we are back on track and prepared for rain on the track. I wander to the window and throw open the blinds and stare in wonder at the crystal clear bluebird skies with barely a cloud to be seen. “Change of plans!” I call out as we gaze at the clearest skies we’ve seen all week. Ben Lomond sits just east of Queenstown and the trailhead can be accessed via the Skyline Chalet Gondola. We toss the laundry back into the closet and pull out our day packs for water, lunch and snacks. As has been our custom after breakfast, we drop by the groups main desk to let them know we will be gone for the day and won’t be participating in the group activities until this evening. “Ben Loamond” I said, when asked where we were headed this morning, “oh, you do know the closing event tonight is being held at the Skyline Chalet?” Nope, we hadn’t heard. “If you show your group badge, you’ll be able to ride the gondola for free and you can stop at the Chalet for the evening farewell dinner at 6:00 pm. Saving you $60 in gondola fees”. Perfect! We drive our rental car to the gondola, knowing we will probably leave the event early, and boarded the gondola. The Skyline Chalet or simply Skyline is an amazing place in and of itself. We hadn’t visited the Skyline this trip because last trip we spent a great deal of time here. The views are fantastic and there are numerous activities to enjoy. Mountain biking and paragliding is the biggest things and we sailed off of this mountain peak last time we were here. A bungee jumper takes the plunge as we pull into the Chalet. Gondola view west. The Remarkables cut the distant horizon. We pass through the Chalet, climb the stairs, and cross over the Luge run. We take a few minutes and watch the racers, try and keep a good line around the twists and turns. This isn’t the luge run of the Olympics. This is basically go carts and a cement track, but it looks like fun as both children and adults come flying around the corner. Soon the shouts and laughter is replaced by the dark confines of a shady forest. The pine needles are abundant and the close knit trees keeps the sound low. 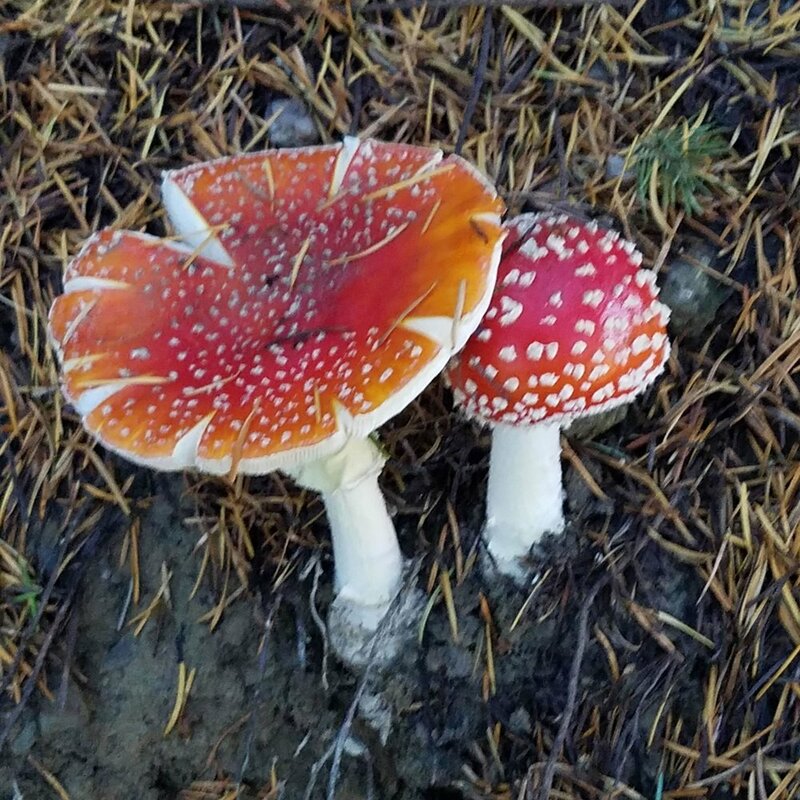 As our eye adjust to the darker environment, Linda spots numerous mushrooms, bright red in color, it doesn’t take much to determine that these are probably poisonous. Apparently, you can eat them after proper detoxification, but they will make you “really ill” if you don’t. I tend to shy away from things that have to go through their own “detox” before I consume. But that’s just me. I found this fun little blog / article talking about the mushrooms. We break through the forest trees onto the grassy hillside to get our first real look at Ben Lomond. It is a stunning peak, as tiny wisps of clouds cross in front of it. Ben Lomond has over 600 meters of Prominence and is ranked number 36 on peakbaggers.com list of New Zealand Peaks with 600 m of Prominence. This will be a great peak to put down, as completed, on my list of peaks. We continue to hike up the well worn track, it is still fairly early in the morning and the temperature has been cool in the shade of the forest and mountain. We are wearing jackets, but the constant climb is starting to heat things up. Linda in the coolness of the shady mountainside. The track continues to move horizontally across the side of this ridgeline, making switchbacks from time to time and working steadily higher toward the ridge. The trail is exposed now, and we are hiking in full sun. But the views from this altitude are incredible. We question each other about the cause of so many dead trees and wonder if it is similar to our local area from a beetle infestation. The line between dead and living trees seems to distinct to be caused by nature, so we continue to ponder until a sign informs us that this type of pine tree is an “invasive” species and to pull any small trees found. Apparently they have sprayed the growth line in an attempt to keep the forest from taking over the mountain. Mystery solved. Arriving at the ridgeline, views into the next canyon open up and we are mesmerized by it’s beauty. I love New Zealand and hope to spend many more trips here exploring the beautiful country. We trek along the ridgeline moving towards a high saddle between peaks of Ben Lomond and Bowen Peak. The ridgeline that we are currently on is basically a mound between two massive washes that serve as runoff from these two peaks. I doubt Queenstown would have been founded if this ridge mound was not here and a single wash funneled the flow to one location. We have been passing a few groups returning from their ascent (they probably didn’t sleep in or think about laundry) and as we draw close to the saddle we can begin to make out people hiking the Ben Lomond ridgeline to the summit. At the saddle, someone has been thoughtful enough to put a bench. We sit and eat a snack. We don’t linger however, as the exposure to this northeastern face has brought with it a cool wind. We put our jackets back on and turn left at the fork to continue our journey. In later review the track to the right circles Bowen Peak and ends back in Queenstown as well. That might be a track for a future time. The sky is becoming overcast but the clouds remain high with little chance of rain. The shade and wind however are cool in spite of the exertion of the climb. A look back shows our recent stop at the park bench and the summit of Bowen Peak. We begin to take more and more panorama view shots as a single frame doesn’t begin to do justice to the view we are witness too. It is still amazing to me that our phone cameras can take such beautiful pictures. Linda’s camera and her eye for detail make for some incredible shots. The Ben Lomond ridgeline trail is steep and snow lingers on the northeastern side, as we “corkscrew” around the summit toward the peak. A lower level of clouds has begun to move in from the north as we watch it cap the top of the higher peaks in that direction. The sun is still shining on Queenstown and we are expecting to still have a great view when we reach the summit in short order. A final twist around the summit peak and we make our way through the snow covered trail to arrive at the summit of Ben Lomond. There are a surprising number of people hanging out at the summit and one Kea bird. We are quickly warned to watch our packs as the Kea’s “urge to explore and manipulate” makes the Kea a pain to have around. We are familiar with pesky animals. For us the chipmunk is annoying on most summits. Frequently visited locations where naïve travelers feed the pests and they become aggressive in the hunt for food. We keep our packs close and enjoy the view. Ben Lomond is a true summit with a limited summit area and the western face reflecting just how steep the prominence of Ben Lomond really is. We sit on the rocks and eat a late lunch. Best seat in the house. One of my favorite quotes is from Rene Daumal, a world class Mountain Climber who was once asked why he climbed. I find his response so fitting as I linger on this mountain summit. Reluctantly we begin our descent. The Kea is gone and perhaps it senses the change in weather as rain clouds begin to billow up on the northern ridges. I’ve been keeping my eye on the clouds and they appear to be slow moving, but it is time to wander off the peak and head toward our “farewell to Queenstown” dinner. If we were leaving tomorrow with the rest of the group, this would have been an awesome final day. The sun is still shinning on Queenstown as we make our way down the trail. We arrive early to our function and take a seat near the back of the room to make an early escape. One of our group hosts approaches us and asks our names. Are we part of the group? She inquires. “I haven’t seen you all week”. Mission accomplished as Linda and I fist bump quietly under the table.